Will is a busy, busy man. Not only is he a local producer of deer-proof heirloom flowers he also works with Whole Foods, a national retailer of naturally produced foods, marketing his daffodil bulbs. Furthermore, Will is a partner in a worm castings business, which also works with Whole Foods. It easy to understand why Will said if he were to write an autobiography he would title it My Life in The Weeds. 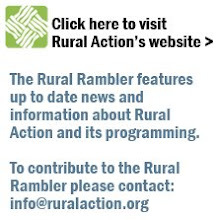 When asked what projects he would like to see Rural Action become involved with in the future Will told us that he thinks Rural Action is already involved in the areas that interest him the most and would like to see Rural Action continue to do the good work they already have begun. He did add, however, that he would like to see more national marketing opportunities for rural local producers. If you are interested in learning more about the flowers that Will has to offer please check out his website, www.deerproofheirloomflowers.com. We would like to thank Will for being such a loyal friend over the years!